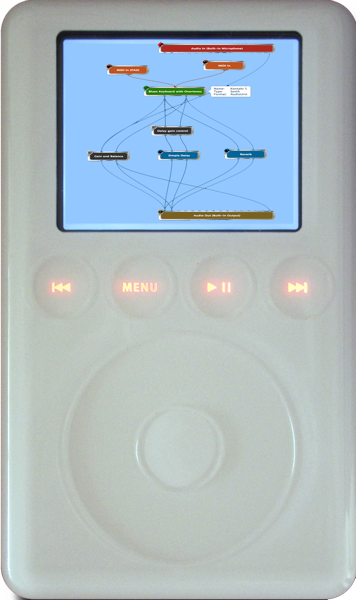 The current importance of sustainability and the desire to recycle old products as one way to help save the environment has encouraged the Gig Performer development team at Deskew Technologies, LLC to create a small version of Gig Performer that will run on Apple’s original classic iPod. There are currently millions of dumped Apple iPods, sitting unused in people’s homes as well as in landfills all over the world. Finding a new use for these devices will have a significantly positive impact on our environment. We encourage users interested in using Gig Performer in this manner to invest in a visit to their local landfill to recover as many of these iPods as possible. Gig Performer for iPod (GP4iPod) will support a very limited number of plugins at a time and only allows up to three rackspaces. Due to the lack of MIDI support, automatic pitch to MIDI conversion will be performed. Deskew Technologies, LLC is a strong believer in the upcoming Right To Repair legislation and so for an extra fee of just $401.19, Deskew Technologies, LLC, will replace the original display with one capable of color so that you can see more easily Gig Performer blocks. A special tool is included, written in classic BASIC and so requiring only an Apple II or a Commodore Pet, that can be used to convert the plugins, both AU or VST3 (but not VST2 per Steinberg’s recent deprecation of that format) in your collection to a format that can run directly on the iPod. The tool will convert all Intel machine code instructions into the iPod’s proprietary processor format as well as loading special libraries to support the standard VST APIs. The processing power of these iPods is significantly limited so GP4iPod adds a special feature that will allow the headset cable to be multiplexed allowing multiple iPods to be connected together using Y-adapters in a proprietary network using a serial protocol. Each iPod will contribute 1 bit of final audio to the final result and headphones can be plugged in to the last iPod in the chain to hear the results. With this configuration, using 16 iPods together will give you 16-bit quality output. Notes can be played by rotating the wheel with your thumb and then pushing the clicker when you reach the note that you want to hear. Unfortunately, there is very little we can do about the sample rate and so there will be about a 4 second delay between triggering a note and hearing the result. As long as the audience members are sitting in a large arena, this delay should be unnoticeable. Because rackspaces created with GP4iPod are compatible with Gig Performer 3.x (Mac/Windows) you will find it convenient to work on your gigs at any convenient moment during the day, during bus rides, boring meetings, dinners you’d rather not attend and while waiting for your turn at those pesky interminable sound checks.